AS Tate Britain prepares to celebrate the swinging decade with the exhibition Art and the Sixties one of the era’s original movers and shakers will be notable by his absence. The exhibition, which opens on June 30, includes some of the best-known artists of the period including David Hockney, Richard Hamilton, Peter Blake and Bridget Riley. But their contemporary David Oxtoby, who studied at the Royal Academy and became an international star of the art circuit while he was still a student is not on the list, despite the inclusion of many lesser known painters from the era. Oxtoby, who in the early 60s caused a sensation by painting pictures of rock ‘n’ rollers, landed one man shows in London, New York and Stockholm before he had even left college. At the time his pictures of Elvis Presley , Little Richard , Jerry Lee Lewis, Chuck Berry, Bill Haley, Buddy Holly and The Big Bopper were unlike anything anyone had seen before. The music writer Mick Farren once said of his works: “They shout at you in the same way as custom cars, neon signs, juke boxes and the stage lighting of a cheap package show.” While art critic Edward Lucie Smith said he knew of no one in England who could draw as well as Oxtoby. The Royal Academy’s 1963 student show was dominated by his paintings and within a year his transatlantic fame was such that he was appointed Visiting Professor at the Minneapolis College of Art. A year later though, threatened with draft papers that could send him to Vietnam, he was back in England. In the crucial few months that he had been away that first generation Brit Art movement of which he had been such an integral part had moved on. David Hockney the friend he had followed from Bradford school, of Art to London was the one making the headlines. For a couple of years he and Oxtoby had shared a scabby student flat in Earls Court while they became stars at the Royal College and the Royal Academy respectively. Finding himself adrift from his old chums Oxtoby took teaching work, principally at Maidstone College of Art, while continuing to paint his beloved rock stars. In 1972 though he cut loose, gave up teaching and has worked as a full-time artist ever since. A cult following developed and there were several major shows. 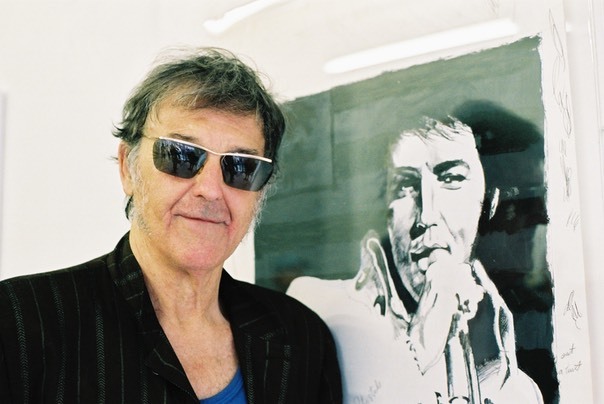 His biggest commercial success was Oxtoby’s Rockers at the Redfern Gallery in 1977 when Elton John bought nine of his works. His 'Rockers' still form the basis of his work. He has in fact been working on the same collection of basic paintings for more than 25 years now. Many canvases have been constantly reworked, painted over or destroyed. Oxtoby however still has many fans including a number of rock ‘n’ rollers but, largely because he steadfastly refuses to compromise – he won’t paint what other people want and he won’t play the fame game – his wider popularity has dwindled. According to a cv pinned to the wall of the Guy Hilton Gallery in Commercial Street E1 Oxtoby has been “Reclusive since 1980”. The gallery is currently showing an intriguing selection of Oxtoby proofs plus a working drawing originally produced for a collection of etchings of Elvis Presley back in 1976. Yet despite a wide spread belief that these days he is a virtual hermit, there at the opening of the show, The King and the Boy King, was David Jowett Greaves Oxtoby, clutching a glass of wine and laughing and chatting with old friends. Despite a battered appearance this cheery Yorkshireman who has lived and worked in Clapham for the past quarter of a century seemed unimpressed by the £18,000 price tag carried by his working drawing of the King of Rock and Roll. “You have to remember that for a time in the sixties my work was selling at prices that put me midway between Hockney and Picasso, so that’s nothing really.” he explained. This seems an unlikely claim but it’s clearly not one worth arguing with. Oxtoby looks a little down at heel but then he says he rarely sells a painting these days. Friends say its not because people don’t want them, just that Dave is so damn picky about letting things go. Considering this he seems remarkably nonchalant about his King and Boy King works from the seventies. But of course they’re not his. Well not any more. “I might have created these Elvis pictures but I certainly don’t own them. I sold them years ago,” he says with a smile and shrug.